This week, Guideline Geo performed the first official test flight with our new drone-carried GPR, GeoDrone. The new instrument is designed to access areas hard to reach using conventional solutions. “This official test flight of our new GeoDrone is an important milestone in Guideline Geo’s long-term work creating social benefits through innovation and technology. This particular solution with a completely new, low-frequency ground penetrating radar that reaches very deep down into the ground is the first of its kind and it is very fun to share it everyone”, says Anders Abrahamsson, head of product development at Guideline Geo. By combining modern drone technology with newly developed MALÅ ground penetrating radar systems, Guideline Geo is looking to develop an instrument that will be able to map the sub-surface or analyse bodies of water in areas where it is difficult or risky to make measurements manually. In short, the GeoDrone is an airborne solution that complements the well established MALÅ product range. The application for the new solution is broad. The drone makes it possible to measure the thickness of an ice sheet and see what is under the ice. Snow depth can be measured for the assessment of avalanche risk. Landmines can also be identified from the air; a big and complex problem worldwide. The drone can also be used to map flood waters. “Our hope is to be able to help with the work of various types of hurricanes such as Andrew and Katrina. 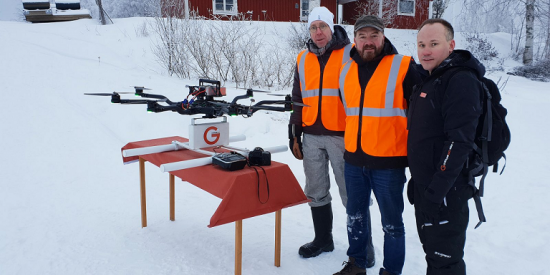 The idea is that with the help of our GeoDrone, we will be able to investigate water masses in order to then be able to plan emergency response and other actions in a more efficient way”, says Anders Abrahamsson.